(0 Customer Reviews) | Write Review 12 issues per year Beckett Baseball is a monthly magazine loaded with everything you need to know about new baseball cards and more. It offers news, values for new releases as well as past sets along with the latest collecting trends. Our readers use this magazine to find out what's new, what their cards are worth, who's hot, who's not and more. For veterans and novices, Beckett Baseball is a must-have resource to stay informed and aware of the hobby. Beckett Baseball is a monthly magazine loaded with everything you need to know about new baseball cards and more. It offers news, values for new releases as well as past sets along with the latest collecting trends. 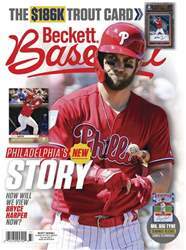 You'll receive 12 issues during a 1 year Beckett Baseball magazine subscription. Below is a selection of articles in Beckett Baseball Baseball-May 19. You'll receive 12 issues during a 1 year Beckett Baseball magazine print subscription.